Passion fruit is an incredibly versatile fruit that is in season between December and July. The flower of passion fruit is actually the national flower of Paraguay, where it is native. This fruit is also native to northern Argentina and southern Brazil. It is nutritious and there are many different ways to eat. It also owns multiple benefits such as quieting wild toddlers. Passion fruit grows on the vine in tropical areas. The rind is either purple or yellow and is smooth, waxy, and tough. The purple varieties have black seeds with a richer flavor and fragrance. Yellow passion fruits have brown seeds and tend to be less juicy. Purple ones are ideal for eating while yellow passion fruits are ideal for preserves or juice. Either variety has a gelatinous, seedy pulp inside that you can eat completely. The flavor can be described as a mix between guava and melon. The easiest method of how to eat passion fruit is to eat it plain. Cut it in half then use a spoon to scoop out the seeds and fruit. Remember that you can eat the seeds. There is a film between the skin and seeds and while this is edible, it doesn’t taste very good. If your passion fruit tastes too sharp, add some sugar while eating. You can make juice out of passion fruit as well. Simply put the seeds and the rest of the mixture into the blender and crush it. You can choose the texture you want and filter out the leaves or little bits. Some common drinks involving passion fruit include tea, margaritas, carrot and passion fruit juice, and passion fruit-ade. You can also learn how to eat a passion fruit by turning it into a sauce. Make it into a sauce like you would with lemon juice. This is particularly delicious on fish or in curries. It also pairs well with coconut sauces or coconut milk. If you have a baking recipe that requires lemon juice, feel free to swap it out with juice from a passion fruit. 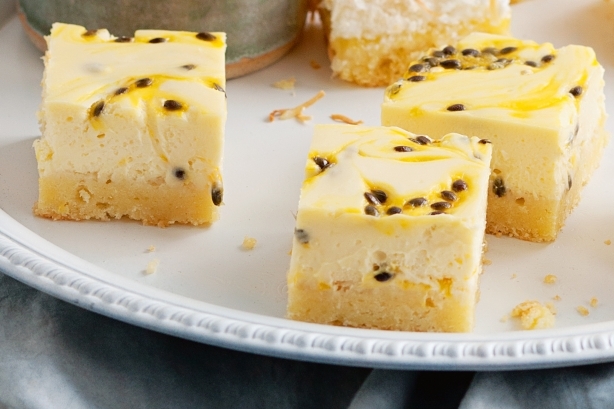 You can make passion fruit cake, passion fruit bars, or even passion fruit poppy seed muffins. 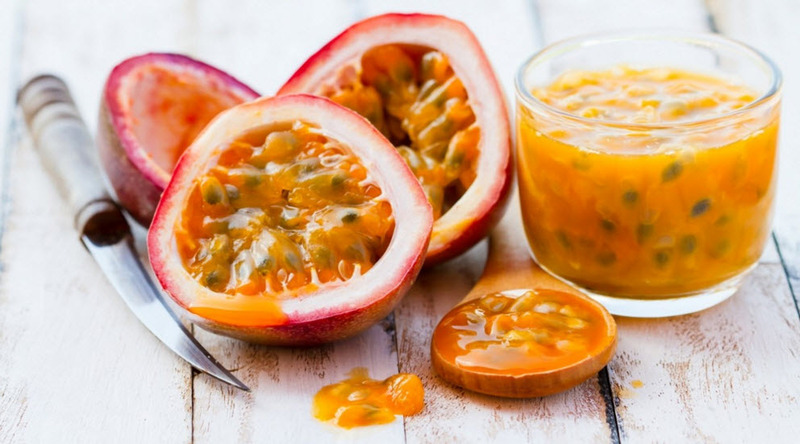 Now that you know how to eat passion fruit, you are ready to get plenty of vitamins. A single serving of 100 grams has 30 mg of vitamin C, which boosts the immune system. The same portion also has 1275 IU vitamin A, which boosts vision, fights infection, encourages healthy cell growth, and makes your skin glow. Passion fruit also has 348 mg of potassium in a serving, boosting heart function as well as blood pressure and flow. It also has calcium, magnesium, and iron. Passion fruit can also calm your nerves and relax the mind. It can help with gastric or digestive issues. It also has soporific effects that help you relax. Drinking a glass of the juice before bed can help one combat insomnia. There are many antioxidants in passion fruit. These inhibit cancer cells from growing in the body. There are fat and water-soluble antioxidants in passion fruit, including beta-carotene. The high fiber content of passion fruit makes it great for clean bowels and digestive health. This property can also be used as a mild laxative. A nutrition research carried out in New Zealand has found that the patients given an extract from the fruit’s peel had reduced the symptoms of wheezing, coughing and shortness of breath. It is said that this was due to the antioxidant, anti-allergic and anti-inflammatory properties of the rind of passion fruit. 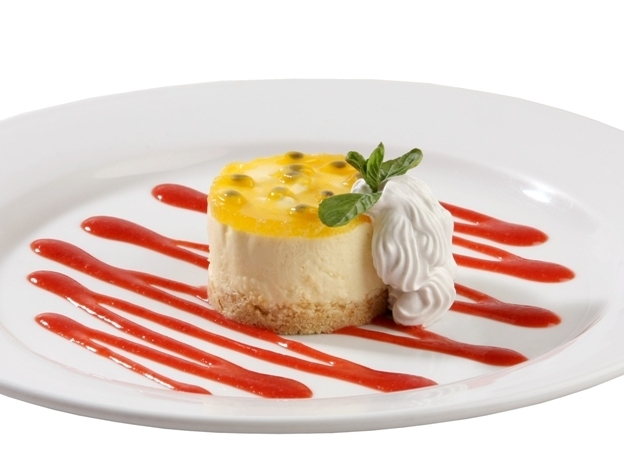 The following recipes can give you some ideas of how to eat passion fruit in creative ways. This dessert tastes best the same day it is baked. You will probably need around 8 passion fruit of a medium-size to create the pulp for this recipe. Preheat your oven to 180 degree Celsius. Prepare a 20-centimeter square tin by brushing it with oil then lining it with grease-proof paper that extends over two sides and greasing the paper. Beat the vanilla essence, eggs, sugar, and butter in a small bowl with your electric beaters. Continue until it is creamy and light, then put in a larger bowl. Sift the flours into the mixture then add the passion fruit. Then, this method of how to eat passion fruit just has you mix until the ingredients are combined. Spread the mixture into your prepared tin evenly. Bake for about 35 minutes, at which point it should be golden, pale brown. Leave it in the tin an extra 10 minutes, then take it out of the tin and place it on a rack to cool. Make frosting by beating the passion fruit pulp, icing sugar, and butter using an electric beater until it is creamy and light. Spread this on your finished cake. Whip the cream using the whisk attachment on an electric mixer. Continue until stiff peaks start to form. Fold in the juice from the passion fruit along with the vanilla and condensed milk. Only mix until all ingredients are well incorporated. Chill the dish for around 2 hours in the fridge. Either put it in a plastic container that includes a lid or cover a bowl with plastic wrap. Keep in mind that you don’t have to do anything for about 2 hours of the prep time while the mixture cools. Juicing the passion fruit should take around 10 minutes. Visit here for more recipes involving passion fruit, whether you want a main course, an appetizer, a cocktail, or dessert. When You Eat Pineapple, Burn Tongue Is Caused by What? Any Bad Effects of Eating Egg?